Celtic Ireland Irish Celtic Stainless Steel Travel Mugs. Quality Double Wall stainless steel. Holds 14oz of your favorite beverage. Spill resistant lid and a comfortable grip. 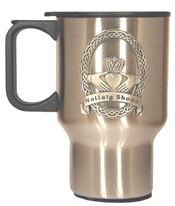 Celtic Ireland Travel Mug with Claddagh Pewter Emblem. 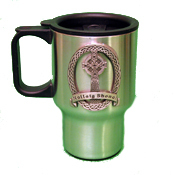 Celtic Ireland Travel Mug with the Cross of Ireland pewter emblem. 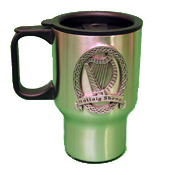 Celtic Ireland Travel Mug with the Harp of Ireland pewter emblem. 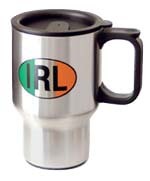 IRL Printed Logo Irish Celtic Ireland Travel Mug.